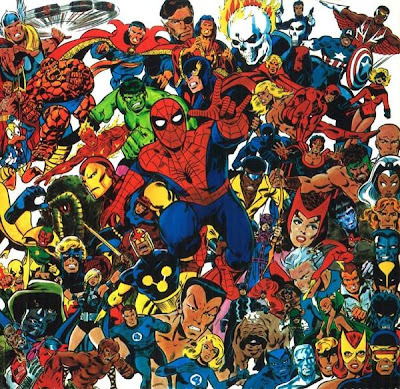 This Sunday I invite you to play a little “Where’s Waldo” and not only find our revered Weather Goddess in these images, but also see how many of your favorite Marvel Universe characters you can name! The above image is by the masterful Michael Golden and it was a poster in the late 80s. Golden knows how to make heroes look super-heroic! I mean, everyone looks larger than life, practically exuding demi-god powers. 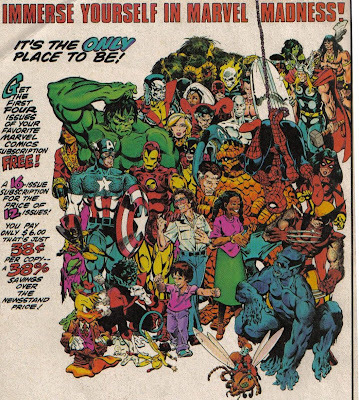 This poster makes the Marvel Universe a place I wish I could really visit! And this is one of the best Storm renderings ever. 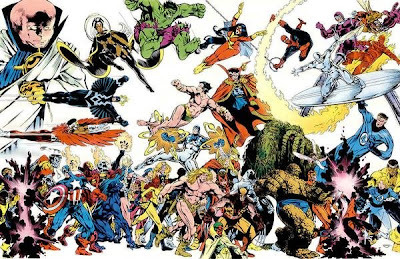 In a bit of serendipity or maybe file this one in the “great minds think alike” department, while searching for more Michael Golden artwork, I discovered that Brian Cronin from Comic Book Resources just posted this exact image on his blog, Comics Should Be Good, this past Wednesday! Which is really cool, ’cause Michael Golden deserves lots and lots of new fans! Check out this post on CBR for some more art by Golden and some more links to his art! Newsarama has an interview with Golden here (It’s from January of 2007, but it reveals a lot about his personality and work–you know he co-created Rogue, right?). This image is also by Michael Golden. Thanks to Comic Book Resources for alerting me to googum’s blog where I found it along with some pretty funny action figure comics–check them out! I’ve been informed that the artist of this piece is John Byrne. It’s really compact compared to the first image for today, varying the sizes of the characters gives it a collage look. Ooh! Look! There’s Valkyrie!